Having spent six years being carefully crafted by songwriter + producer Sam Cooper, Apophenian was released earlier this year. This 11 track album takes its time and pays attention to detail as the robust piano and rich instrumentals mix with Cooper's smooth vocals to stir up a mixture of both beautiful and haunting melodies that draw you into the most ethereal of fever dreams. Traces of classic rock influences appear throughout, with glimpses of The Beatles and Pink Floyd-esque delivery, most notably in the opening track "Never Odd or Even." This number sets the course for the album, navigating its way through an array of subjects with a focal point of psychedelic alt-rock. "One Thousand Pounds" is a lush ballad while "Monster Heart" has a building wave of sound that one can easily get lost in, only to be brought back to earth when the following track, "Women Into Water" begins. "Women Into Water" proves to be a diversion from the majority of the album's sound as it's a quieter piece, and solidifies its place as a stand out number in the lyrical sense early on with lines like "To try kissing your skull / To get at your brain / And reach some of the sickness you hold / To worry about / Your aching windows." As the album progreses, "So Small and So Loud" explores the paradox that is our collective existence which has likely kept you up at night as you attempt to drift off to sleep. The following track ,"Bloodletting," takes a percussion driven approach that's highlighted by Cooper's animated and emotion laden vocals. Apophenian is a deeply personal + passionate record. Each track has the ability to reach you in different ways, perhaps with the meaning of each song forming to meet your current emotional state upon each listen. I had the chance to chat with Cooper about the writing process for Apophenian, the story behind the album art, and more. You can read the interview below! Q: Apophenian was six years in the making prior to being completed. How did you know that it was finally ready to be released? A: One of my favorite quotations (commonly attributed to Leonardo da Vinci) is "art is never finished, only abandoned." The shortest answer I can give is that I had high aspirations for the sound and conceptual execution of this record, and it took me and my wonderful collaborators a long time of experimentation and reshaping, but we finally arrived at a place where we felt we had hit the marks we had been aiming for. The longer answer is less tidy. The bulk of Apophenian was completed during an excruciatingly difficult time in my life, and I think in many ways throughout that period the album became a comfort blanket, something into which I could retreat and tinker away, both to process and forget my pain. I eventually became caught in an endless cycle of remixing, tweaking, fiddling, finessing, trying to reach some illusory goal of perfection always just over the horizon... the creative process itself mirroring the kind of spiral of anxiety and delusion I was experiencing in my personal life. The climb out of that cycle (in both aspects) wasn't necessarily instant, but I arrived at a point where I was ready to let go of the past and move forward. It started to feel almost selfish to NOT release the album. Not that I consider it some huge gift to the human race, but rather I came to a recognition that art's power relies on its potential to reach people, that it can't truly do its job without an audience. From that perspective, I knew that I had to "abandon" my little pet project-- that I had done all I could for it, that more work didn't equal more better, and that it was ready to be entrusted to the ears and minds of the audience for which it was made. Doubts and fears dropped away, replaced by pride and excitement at the prospect of releasing it. It finally felt done. Q: The album art for Apophenian is psychedelic and funky-- the colors are beautiful. How did you decide on this design, and what was the create process like? A: The original inspiration for the design came to me out of nowhere -- I just had a vision of being adrift in a sea of paper flowers, swimming in an expanse of Victorian petals and using them to paint an image. I've long been drawn to vintage botanical and scientific illustrations; they occupy this space between hyperrealism and ultra-aesthetic idealized beauty--almost an uncanny valley of representation. Once the sound and themes of the album started to become clear to me, I knew that I wanted the cover art to communicate beauty and chaos in equal measure, to be at once overwhelming and soothingly familiar. And so it became a manifestation of the album's title. 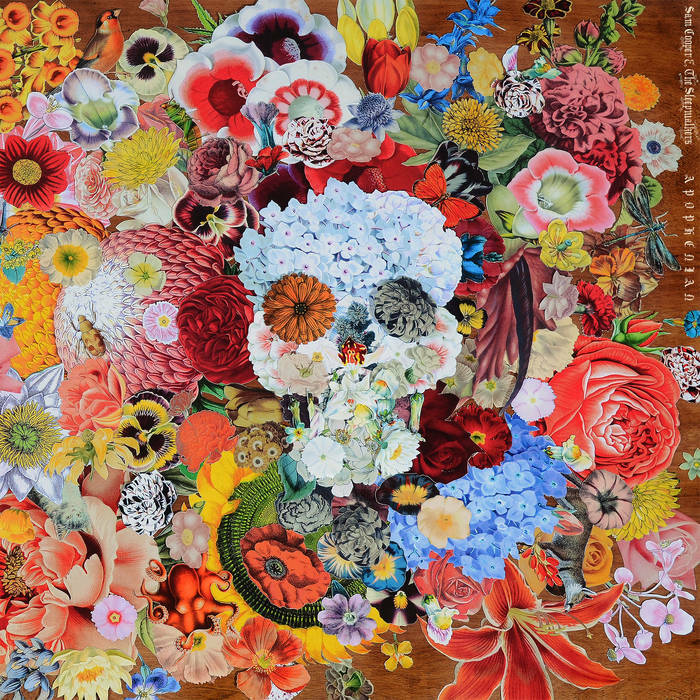 Apophenia is the human tendency to perceive patterns in random data, and using the flowers to "paint" the impression of a skull not only achieves that manifestation literally, but also transmits one of the album's central messages: that allowing our inherent tendency towards pattern recognition to run amok under the guise of neurotic analysis and grasping for control leads to great suffering. The art itself took about a year to complete, most of which involved finding and printing out vintage images of flowers, and cutting out each one by hand with an exacto knife. In the end, the finished piece was four feet long and two feet high. Since scanning wasn't an option, I ended up photographing it at a friend's studio, and used two different arrangements of the flowers for the exterior and interior spreads. Voila! Q: One of my favorite tracks off of the album is "Bloodletting" due to the lyrics. What's the inspiration behind the lyrics for this track, specifically "I know the draw of zeros and ones / The coward’s soft all-or-none"? A: Without giving too much away hopefully, that song is in large part about the value and cost of sharing your true self with the world: how much to reveal, how much to obscure, how much good or ill comes from the interchange of intimacy. When we give away pieces of ourselves, it can feel very much like spilling blood--some vital part of ours, once inside, now let dangerously outside. It often seems safer to shelter ourselves in easy, black-and-white binaries rather than risk the exposure of our grays to an often uncaring and hostile world. Why come out as bi when you could pass as the more-accepted straight or gay? Why dare to step outside of the tribalist comforts of hard-line Republican or Democrat thinking when it's so much less trouble to just join in either chorus? Inhabiting a position on any extreme is going to be easier than taking your place on more nuanced ground, but ultimately less courageous. I would personally argue that there's intrinsic value in being as openly individualistic as you can, difficult though it may be. Q: Being from Washington DC, what's your view on the East Coast music scene in regards to accessibility? A: Tough question. Since I'm only really familiar with the DC scene, I can only answer from that perspective. There is SO MUCH obvious talent in this city and on this coast... so much so that I feel like oversaturation is a real issue. It often seems nearly impossible to break into any scene because there are simply so many amazing bands deserving of attention, and outside of close-knit genre circles, there isn't a super-clear scene to speak of. For a band like mine, which doesn't fit easily within genre boundaries, it feels very much like being a small fish in a big pond. I'm really not disparaging the fine people of Washington, who I love dearly and whose taste is impeccable, but rather pointing to the lack of a cohesive community that supports and elevates local music beyond the point of playing the circuit of small local venues. This doesn't seem to be as much of a problem everywhere; I've witnessed much more support for local music in other cities off the East Coast, and I can only point to that small-fish, big-pond issue as a possible cause for that disparity. That being said, I feel like this is likely more a reflection of the place music has come to in our culture at large, where anyone with a laptop or access to a Guitar Center is encouraged to start a band and put out music, and where "album" is becoming a foreign concept to music consumers in the age of Spotify and celebrity worship. It's a real case of supply mismatching demand. BUT none of this means I think all hope is lost. I have faith in people's need for art, and the east coast, and my great city specifically, have had a long history of being bastions of culture and musical greatness. Q: In addition to themes of love, loss, and sadness, Apophenian is self described as touching on the cosmic experience. What does that mean to you, and how does that translate into your writing? A: The cosmic experience to me is, at its core, the feeling of absolute personal smallness in the face of the universe's unimaginable complexity and deep mystery. This may come off negative or scary, but I think it's actually the opposite. That feeling is ultimately what allows us to know wonder, curiosity, gratitude, interconnectedness, and transcendence. Being aware of our place in the cosmos, as tiny and tenuous as that place may be, is crucial to our ability to see reality clearly, to appreciate the sometimes painfully fleeting and impermanent nature of our existence, and to love fully the gift of life we've been given. The sense of the numinous is something that pervades my writing; since it's such a huge part of my outlook, I can't help but create through that filter. A lot of my music is about pain and other difficult mindstates, trying to find meaning in that suffering and confusion. Every time I ask the question ("what does it all mean??") I eventually come to the same answer, which isn't an answer at all... just that feeling, that cosmic feeling of being... in a human mind, in a human body, on a planet full of beauty and ugliness and life and death, hurtling through a wondrous and inexplicable, tantalizingly comprehensible and yet totally mysterious universe. In that way, music and art are doorways to comfort and clear view for me, with the power to salve the deepest existential crises, and I think they can be the same cosmic medicine for anyone else who's open to their message. Q: Moving forward, what cities would you love to play a show in and why? A: Any and all! Seriously, I just want to play as much as I can in as many places as possible. But if I had to narrow it down, I would maybe say the West Coast and Pacific Northwest are dream destinations. I've never played there and I have this unshakeable sense that our music would find a home in the hearts of more westerly listeners. Seattle has produced some of my favorite musicians and bands, so I've always wanted to play there specifically. I feel like SC&S makes rainy-day music and we'd likely find a warm reception in gloomier climes!